Exciting events happening at the Dakota Homestead! This newsletter is going out to over 700 people! Each of you chose to write your name and email down on a clipboard at one of our booths, or visited the website and signed up to receive our news, or talked with us and decided to get involved. You are here because you want this Dakota Homestead project to become a reality. You want to see this small piece of land become more than just a couple of new houses. To see it become a cornerstone of our community that adds value, grows relationships and grows food. You want to walk through the fruit orchard when cherries, peaches, apples and pears are growing. You want to bring your children or grandchildren to show them how blueberries grow on a bush, or snack on some fresh snap peas and watch their faces light up. You want to be inspired to turn part of your yard, your patio, or your windowsill into a garden that will grow food and herbs and you need to see, smell, touch and taste what is possible. Maybe you just want to prove that the power of people coming together to accomplish something positive for their fellow neighbors still happens in this unsteady time. We each want to look back years from now and know that we made a difference in our community and in the lives of our fellow humans - and this is one way we can make a big impact. This is more than raising money to purchase a piece of land. It's raising money to provide a place for us all - for wonder, knowledge, inspiration, connection, peace and food to grow. For years and years to come. Thank you for joining this journey, actively getting involved, donating money and time to making the Dakota Homestead a reality. This is our year to get it done! We are officially a tax-exempt 501(c)(3) organization! After 9 months of waiting, the IRS has granted us tax-exempt status! This is a huge milestone for our organization and allows 100% of every donation to go directly to Urban Homestead Foundation. All donations to Urban Homestead Foundation are tax-deductible. A huge thank you to Admiral Neighborhood Association for their fiscal sponsorship support over the last year and their continued partnership. Generosity.com: Help Us Establish the Dakota Homestead! Our goal is to raise $35,000 in 30 days. If everyone on this list made a donation of $25 to $250 we'd easily reach this goal. Let's raise the money together! Major donors and foundations are more likely to match the funds raised by the people who are directly impacted by the purchase of this property. In order to unlock some important grant money, we need to show the enthusiasm of the neighborhood and concerned citizens. We’ve launched an online giving campaign this week and we need your help to spread the word. Every gift counts – please give today and share the campaign with your friends and family, near and far! We can do this together. Grant updates: We have applied for 3 grants and are waiting to hear back on nearly $400,000 in funds. Keep your fingers crossed. And let us know if you have leads on a company or foundation grant that we can apply for. Right now we’re particularly interested in connecting with anyone who works at Nucor Steel – if you know of anyone (or you’re that someone! ), please be in touch. 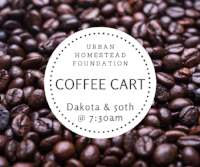 Over the next month we’ll be serving coffee at the Dakota Homestead site. Join us on Tuesday, March 7th, Friday, March 17th or Thursday, March 23rd from 7:30-8:15. We’re so thankful to Admiral Bird and C&P Coffee for their donations and look forward to featuring more local coffee shops for future Coffee Cart dates! We had a successful (and not too cold and rainy) block party this past weekend. Nearly 50 people showed up to talk about the potential of this vacant lot and the energy was palpable. We’ll plan on hosting another gathering at the site after the weather warms up, and we hope to see many more of you there. Special thanks to The Beer Junction for the beer! One artist's imagination of what the Dakota Homestead might look like. Could you imagine yourself using this? What would you suggest? Visit the website to add your thoughts to the feedback survey. Thank you for supporting this community project! Copyright © 2017 Urban Homestead Foundation, All rights reserved. Thank you for signing up for our newsletter, either through our website or in person at an event! We look forward to keeping you connected with the Urban Homestead Foundation!